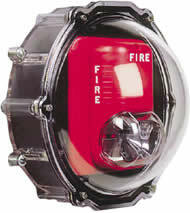 UL Hazardous Listed to U.S. and Canadian safety standards. Rated for indoor and outdoor locations. NEMA 4X Rated. Dust tight (Class II Group F and G Div. 2). All Class III locations. CSFM letter available authorizing local AHJ's authority to grant permission for use. This virtually indestructible cover is designed to stop vandalism and accidental damage to strobe units. 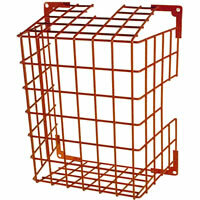 This cover provides maximum protection in harsh conditions. 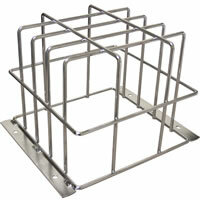 Weatherproof cover is NEMA 4 and NEMA 4X Rated and UL, cUL Hazardous Listed. Product includes an enclosed backbox. Unit incorporates an appliance mounting plate that eliminates the need for an electrical outlet box. Molded of clear, thick, UV-stabilized polycarbonate material, polycarbonate is backed by a 3-Year guarantee against breakage in normal use. This virtually indestructible cover is designed to stop vandalism and accidental damage to strobe units.